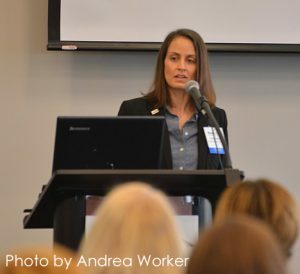 HomeAid Northern Virginia Executive Director and CEO Kristyn Burr speaking at the 2018 Housing Forum. Racism can be an uncomfortable topic for many, but that doesn’t mean we can ignore it. The same goes for racial inequity, which is real and has an enormously detrimental impact on an individual’s ability to pursue life opportunities, career advancements, and equal wages. But we need to go well beyond recognizing it; we need to talk about it and find strategies for reducing its prevalence and impact. I’m proud that next month HomeAid’s Housing Forum, entitled Leading with Racial Equity: Data and Beyond, will serve as the platform for bringing this important topic into focus this year across jurisdictions. We all need to look within our own organizations, ensuring diversity, equity, and inclusion amongst our staff and Boards, as well as expanding out into our respective communities with that same message and commitment. I’m pleased that HomeAid is providing this kind of opportunity for Continuums of Care (COC) government entities, care providers, our nonprofit partners and beyond. I first learned about the Center for Social Innovation because they spoke at the National Alliance to End Homelessness (NAEH) conference on the west coast, and I was told how incredibly powerful and informative their keynote address was. I realized that this was a very important topic and most organizations, who are already working with very tight budgets, can’t often afford to send anyone to conferences like that, especially when travel is involved. So, this year’s Housing Forum is our way of bringing those powerful, high-level, nationally recognized experts to you, for zero cost and very little travel. We all need to be part of the conversation and the solution. We are very excited to welcome the Center for Social Innovation to our area – I hope to see you on May 9! HomeAid Northern Virginia’s Annual Housing Forum has established its reputation as being the place to gather the region’s thought leaders and housing and homeless service providers from non-profit and governmental organizations under one roof. We’re known for providing deep, thoughtful opportunities to debate challenges that are shared by all who work in the areas of providing outreach, shelter, housing, mental health and addiction services, health care, and Continuum of Care planning and implementation. This year, we’re going even bigger: On May 9, we’ll welcome Keynote Speakers Regina Cannon, MS, chief equity and impact officer, and Jeff Olivet, MA, senior advisor, from the nationally renowned Center for Social Innovation (C4). Both speakers will address “Racism and Homelessness: Beyond the Data,” focusing on racial inequity and improving the lives of marginalized and vulnerable people, all against the backdrop of how race plays a significant role in homelessness issues. After lunch, an optional interactive session will be offered for Continuum of Care leaders and provider decision makers. During this session, which will surely challenge the status quo, participants will discuss what organizations need to do to create a culture that supports racial equity in the workplace; how teams can begin that important work internally; and how we all can encourage a philosophy of racial equity to spread outwards, into our communities. 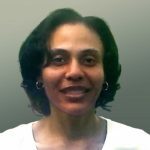 Regina Cannon has dedicated her career to being a vocal, active leader fighting for equitable policies, systems, and institutions and addressing the marginalization of people of color. She has more than 18 years of experience leading anti-poverty initiatives addressing homelessness, supportive housing, criminal justice reform, community capacity building, and youth leadership development. She has Master’s degrees in Counseling and Developmental Psychopathology from Florida State University. Jeff Olivet is a national leader on homelessness, poverty, affordable housing, behavioral health, public health, and HIV issues. He has been a street outreach worker, case manager, housing director, coalition builder, writer, teacher, and activist. His work with hundreds of organizations across the United States and internationally has helped to improve strategic planning, organizational management, and implementation of evidence-based practices. 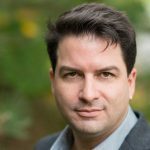 Jeff is a recognized expert in bringing innovative technologies and solutions to complex social problems. Jeff received a MA from Boston College and a BA from the University of Alabama. Registration for the 2019 Housing Forum is now open! Minority groups in the United States experience homelessness at higher rates than whites, and therefore make up a disproportionate share of the homeless population. Hispanics make up a share of the homeless population approximately equal to their share of the general population, and Asians are underrepresented in homelessness. By far the most striking disproportionality can be found among African Americans, who make up 40 percent of the homeless population despite only representing 13 percent of the general population. HomeAid Northern Virginia’s leadership and staff joined representatives from HomeAid America’s 18 other chapters at the organization’s annual conference, and enjoyed a ‘field trip’ to the Colorado Homebuilding Academy. 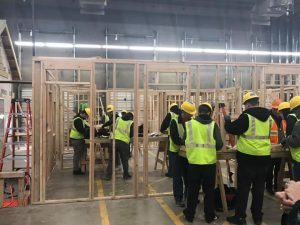 The Academy helps train the prospective homebuilding workforce and provide jobs to those HomeAid serves. After getting to know HomeAid America’s Board of Directors in February during the organization’s Annual Board Meeting, HomeAid Northern Virginia Executive Director and CEO Kristyn Burr attended HomeAid America’s Annual Conference in March, along with President Gary Chandler and Communications Director & Program Manager Kathryn Kovacs. 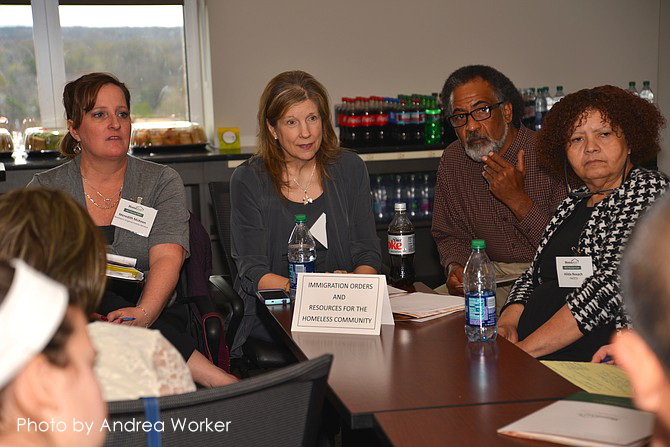 The annual, three-day event gathers all 19 HomeAid chapters together to share best practices, provide a forum for sharing and swapping proven collateral materials, and debating strategies for working to end homelessness across the country. Opening conversations centered around HomeAid’s Chapter Operations Survey, which served as the baseline for numerous topics covered during the conference, including an examination of the HomeAid model, its evolution over the last 30 years, and future new initiatives. Attendees from all 19 HomeAid chapters also toured the Colorado Homebuilding Academy, an industry-driven solution in Denver that seeks to expand the homebuilding workforce by training those looking for a career in construction; expanding the workforce with skilled talent; connecting prospective employees and employers; and providing youth apprenticeship programs. With a major HomeAid goal being to develop more employment opportunities for service provider clients through a grant-funded HomeAid WORKS Program and ensure that there is an adequate pool of qualified workers for the homebuilding industry, the tour proved inspirational that such an outcome is achievable. Other topics covered included HomeAid-led efforts following natural disasters, “tiny” and container homes, and sustainable fund development. Sparkling new flooring and freshly painted walls await new tenants at an affordable housing unit recently refreshed by HomeAid Northern Virginia for Shelter House. Last year, HomeAid Northern Virginia rolled out the “turnover program,” designed to help organizations quickly prepare units that simply need a refresh before new tenants can move in. The program focuses on painting the interior and updating the flooring—most often replacing carpeting with vinyl planking, which has a higher upfront cost but is far more durable and easier to keep clean. Three shelter and affordable housing organizations have taken advantage of the turnover program since its launch, allowing faster turnaround between tenants, boosting the dignity of their residents, and saving a total of more than $36,000 over seven turnovers. In just the last month, we’ve completed two turnovers at Shelter House and have two more in the pipeline for Pathway Homes. “Shelter House has 10 units in our affordable housing program,” said Dani Colón, MSW, deputy executive director at Shelter House, Inc. “We almost always run the units at a deficit, because we rent to formerly homeless families or very low-income families on sometimes-significant subsidies. Tenants also tend to stay only a year or two before moving on to independence, so incurring expensive turnover costs for these units make them even more costly for us to operate. The two units that HomeAid just completed for us needed the typical paint and floor refresh, and the paint alone saved us $4,000. And, because they replaced the carpet with vinyl planking, we saved $10,000 more. The floors will be so much more resistant to wear and tear, as well as easier to keep clean … these are cost savings that will build over time, and we’re so grateful. The turnover program is fully funded by HomeAid to ensure that turnovers can be completed quickly and a new family has the opportunity to find stability and safety in a short period of time. Contact us for more information! Poverty, particularly deep poverty, is a strong predictor of homelessness, and African American households are much more likely to experience poverty than their white counterparts. More than one in five (21.4%) African Americans live in poverty – 2.5 times the rate of whites (8.8%). The people behind John Darvish Construction Company and Darvish Interiors have long been avid supporters of HomeAid, consistently showing up at events, volunteering, sponsoring, taking part in renovation and building projects, and spreading awareness within the industry about our mission of ending homelessness in Northern Virginia. Dan Howard, general manager at Darvish Interiors, formally teamed up with John Darvish in 2014 and has been an equally enthusiastic presence at every level of HomeAid ever since. 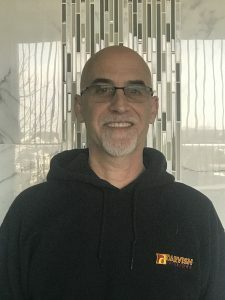 Read on to how he has helped advance one of our newest initiatives, the turnover program, and why he says ‘yes’ to working with HomeAid. Q: What do you think about the Darvish companies’ philanthropic philosophy, and what do you personally get out of your involvement with HomeAid? A: One of the things that made me want to work with John was the fact that he is such a genuinely good person. He has always been an avid supporter of HomeAid—whether it’s working on projects, serving on the board, or sponsoring events. We both wanted Darvish Interiors to be very active in HomeAid, as well, and I’m proud of our involvement. I personally get great satisfaction out of knowing that we have helped to put a roof over someone’s head and made a difference in so many lives. Q: Darvish has been instrumental in advancing HomeAid’s “turnover program,” which focuses on quick painting and flooring refreshes that get properties ready for new clients very quickly. 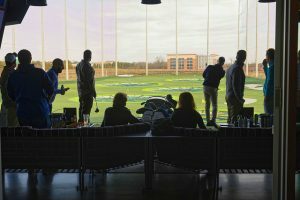 What have your impressions been on this program in terms of impact? 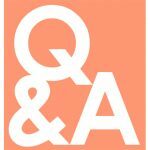 A: When [HomeAid Northern Virginia Executive Director and CEO] Kristyn Burr approached me about the new quick turnover program, I thought it was a great idea. These projects are relatively small-scale, so there is no need for a Builder Captain to coordinate all the trades. It’s just a matter of changing the floors, getting the unit re-painted, and getting a family moved in. 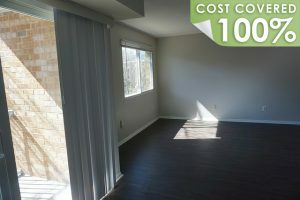 Kristyn also wanted to use luxury vinyl plank (LVP) flooring in these units rather than carpet, which helps eliminate the time and expense of constantly replacing carpet and will ultimately get families out of a homeless situation and into a home faster. Q: Do you have any favorite HomeAid events? A: While I enjoy the Annual Gala & Auction, with the awards show atmosphere and incredible fundraising it generates, I would say that my favorite event is the Builders & Friends BBQ every summer. It is more my speed—a laid-back chance to network with colleagues and have a beer in a beautiful setting. Q: Tell us about your career. What do you enjoy most? A: I started working for a neighbor who had a ceramic tile business during the summers while still in high school. I worked mostly in the tile business until I took a position with Floors, Inc., where I got into the rest of the flooring world with carpet, vinyl, and hardwood. John Darvish and I had served on Trade Partner Councils together, and we developed a great professional relationship over the years. Several years ago, he told me he also worked in the flooring business when he was living in Texas and that he was interested in starting something here. It didn’t take long to decide that it was a great fit, and we were up and running soon after. I think what I enjoy most about my career is knowing that we helped build someone’s home. At the end of the day, we actually built something lasting. Q: You’ve just met someone in the homebuilding industry who hasn’t heard of HomeAid. What do you tell them? A: You should get involved because it’s easy. You don’t have to go outside your comfort zone. You just need to do what you are good at, for a good cause. And, nobody should have to worry about where they are going to have to sleep tonight; if they are going to be able to stay warm; or if they are going to be safe, especially if they have children with them. You will sleep better, too, knowing that you are part of the solution. More than half of U.S. residents without health insurance are people of color. 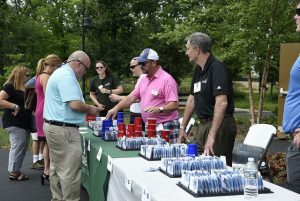 If you want to check your golfing form or just relive the fun of our March 2019 GolfAid event, be sure to head on over to our Flickr page, where almost 100 photos are now posted! Thanks again to Bob Narod Photography for capturing the fun! Get ready for some BBQ, Craft Beer & More! Have you worked on a HomeAid project in 2019? Then be sure to get in touch with Events Manager Cilda Pretorius to confirm your attendance at our 10th Annual Builders & Friends BBQ on June 20. Every trade partner, supplier, or builder subcontractor who has participated on a 2019 HomeAid project gets two complimentary tickets, a $100 value! HomeAid’s BBQ is one of our most popular networking events and registration is NOW OPEN! Ready to put your company name in front of the hundreds of influencers who attend? Sponsorship opportunities of all sizes are also available; please contact Kristyn Burr for more information. 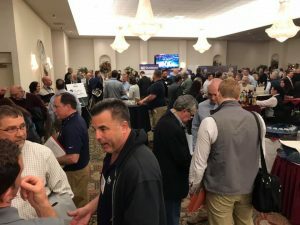 We always enjoy NVBIA’s popular “Meet the Builder” event, which attracted nearly 500 people two weeks ago and gave us a great opportunity to catch up with Builder Captain partners, explain our mission to those who may not yet know us, and work to recruit additional builders to our Builders Circle of Excellence. The more Builder Captains we have, the more projects we can complete every year! To those of you who stopped by to say hello, thank you! HomeAid Northern Virginia was started by the Northern Virginia Building Industry Association (NVBIA) in 2001 and since that time has been the charity of choice for the Northern Virginia homebuilding industry. Last month, we gave a fond farewell to Jon Lindgren, NVBIA’s Vice President of many years. Jon recently accepted a position with DFM Development Services in Falls Church, Va., and we wish him the very best in this new chapter! We will be sure to announce NVBIA’s new leadership once they are in place.